Yesterday was Mother’s Day here in the U.S., and my brother and I took Mom on a picnic. 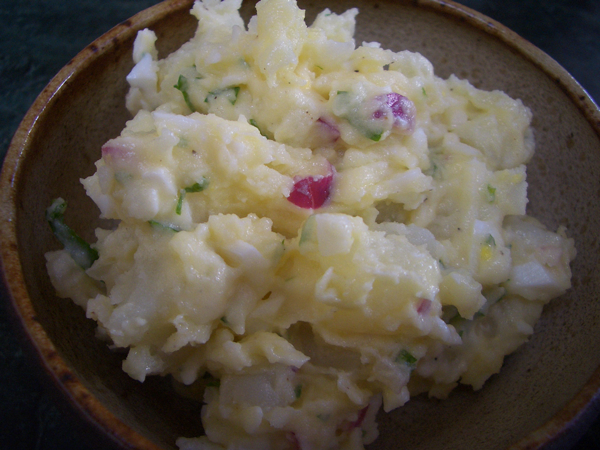 Potato salad is one of those things synonymous with eating outside, and as far as I’m concerned it doesn’t get any better than this version of the classic side dish. When you have a recipe as simple as potatoes, mayo, and egg, it is only a matter of time before someone gets the bright idea to throw something else in there, and then something else… Of course there’s nothing wrong with truffle oil and roasted peppers and lemon zest and capers and pickles and a host of freshly chopped herbs, but they can wait to hitch a ride on another recipe because this one tastes great the way it is and the way it’s been made for decades by my family. I always thought my mother came up with this recipe. In getting the recipe from her, I found out that it originated with someone else long ago and far away. 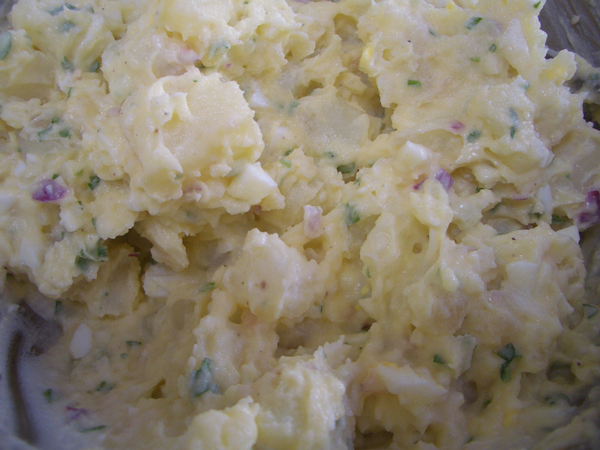 It doesn’t matter who “invented” it–it’s the family potato salad. It has been in attendance at every bridal shower, christening, and birthday. But I always liked it best when Mom made it, so it is to her I tip the hat. Though it tastes great right away, the more the ingredients are allowed to meld, the better the flavor, so if you can, make it the day before you serve it. 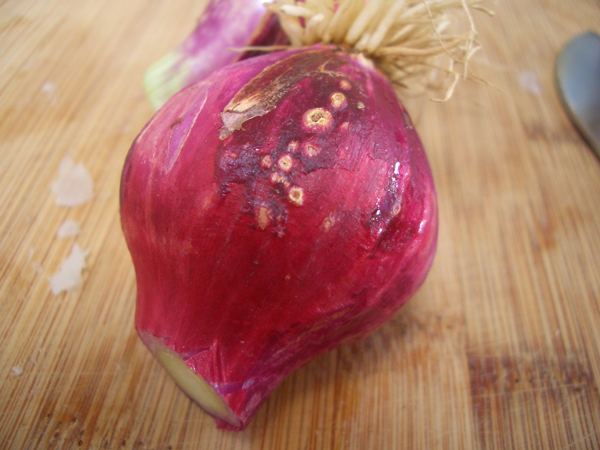 1/3 cup (80ml) onion, chopped fine–I used purple spring onions, but use what you like, white, yellow, etc. 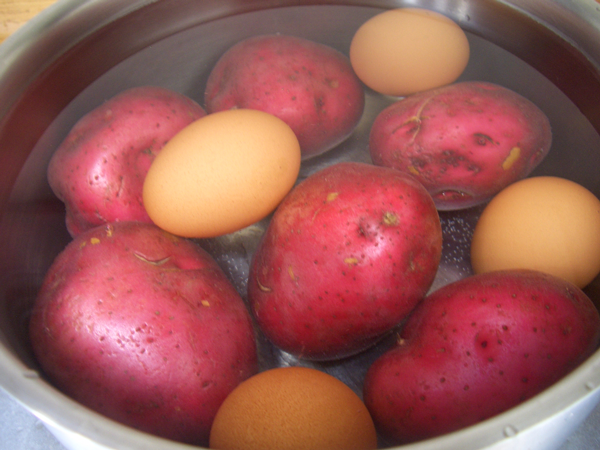 To save time, I boiled the potatoes and eggs together. I put both in a large stock pot filled with cold water, set the heat to high, and from the time the water came to a rolling boil, I started the timer for 12 minutes. At the 12 minute mark I removed the eggs with tongs and plunged them into ice water to stop the cooking, and continued to boil the potatoes for another 5 to 8 minutes. You want them to be tender but firm. A fork should pierce the flesh but the potato shouldn’t break apart the way it does when you make mashed potatoes. They are going to continue to cook a bit in their skins after you remove them from the water so keep that in mind. To make the eggs easier to peel, once they’re cool enough to handle, crack them enough that the inner membrane is broken and put them back in the cool water. Wait until they are completely cool, and peel. 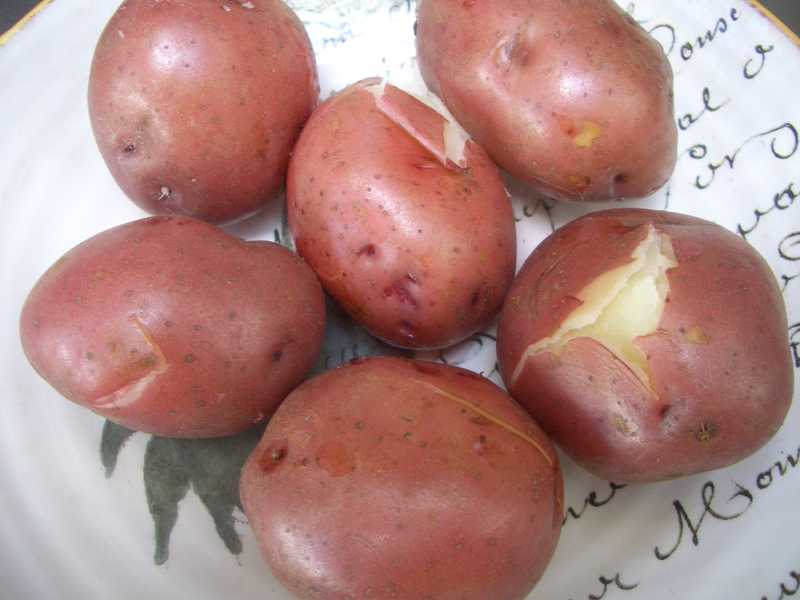 In a bowl, toss the warm potatoes with 2 tablespoons (30ml) of the vinegar, and set aside to cool. 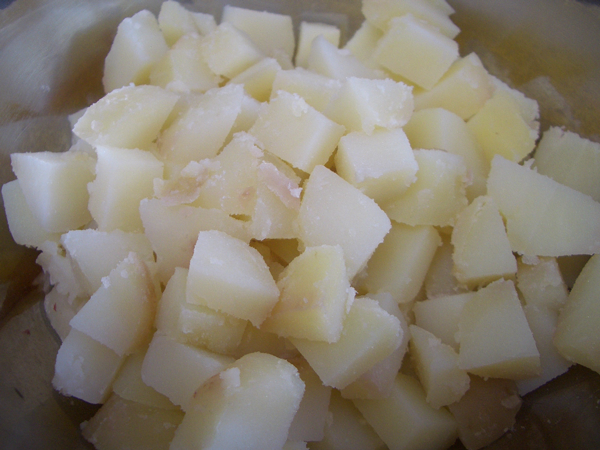 Peel the cooled potatoes, cut into cubes, and transfer to a mixing bowl. 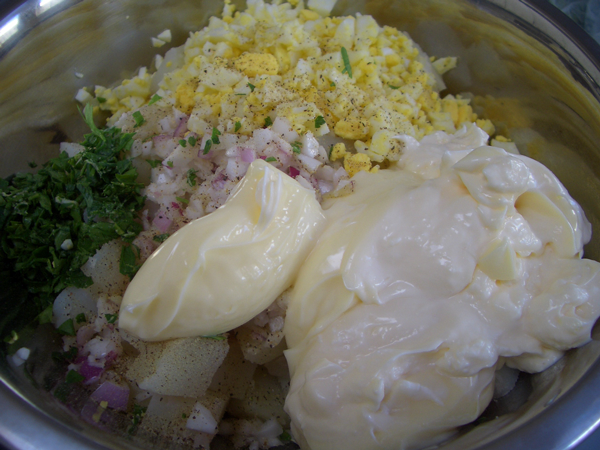 Add the chopped eggs, onion, garlic powder, remaining 2 tablespoons of vinegar, sugar, parsley and mayonnaise. Mix together and add salt and pepper to taste. You probably won’t need salt. Will definitely be making this Maria!